The Design is exactly what you want to see from a new sports car on a new platform. A lot of people are divided on the design, which is a good thing. Division and conflict about the product will keep it in peoples mouths all the way to launch time. It has the best implementation of the still-bad predator face. The headlights and associated accents feel like I saw them in minority report somewhere (and that is a compliment) . The more I see it, the more I like it. The LFAs V10 is not under the hood of this car, but it should have been. Failing that, they should have tried to meet the performance benchmark set by it. At $75k, it’s a pretty good deal. At $100k - a price bracket crowded with totally awesome offerings from other Brands which have pedigree - this car is down on value. That’s not where you want to be when launching a brand new platform in an extremely competitive bracket. Let’s talk about the competition and cross shopping for a moment. 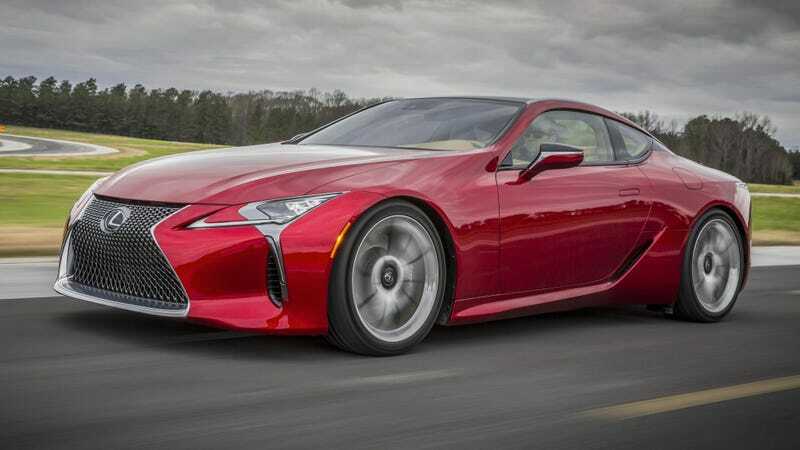 Because the perception among enthusiasts in the ‘pro LC500' coulomb is that there isn’t any for this car. No. ‘People don’t cross shop X against Y’ is what you say when you don’t have the cash in hand ready to make a decision. Actual consumers and individuals who don’t read Jalopnik and aren’t enthusiasts will decide what this car competes with, and they’re going to cross shop whatever they want. Will it matter to them that the GT-R for the same money is way faster than this? I don’t know. I do know that the market is spoiled for choice in this bracket, and it will not balkanize itself around this particular car just because we enthusiasts like it a lot. One major problem with this car though; it doesn’t actually fix Toyota’s image as a stodgy producer of boring beigemobiles. For every LC500 and GT86, you have the Camry, the Corolla, the Avalon, the Prius family, the Yaris, the Scion group and the All of Lexus’ lineup. One rich person’s halo car every decade or so cannot reverse the image that two whole brands worth of products generate every year. My advice here is to steal the same plan Ford stole from the Europeans; make good base cars that people will buy en masse and sport them up a bit. An AWD 375 HP Camry GT trim level for 2020 would do a lot more to change brand perception than building a [Whatever replaces the 918] competitor for $[Infinite] 20 years from now.